For ither uises, see Medina (disambiguation). Muhammad's tomb is locatit unner the Green Dome o Al-Masjid al-Nabawi. Medina (Inglis pronunciation: /mɛˈdiːnə/; Arabic: المدينة المنورة‎, al-Madīnah l-Munawwarah, “the radiant ceety” (offeecially), or المدينة al-Madīnah; an aa transliteratit as Madinah) is a ceety in the Hejaz region o wastren Saudi Arabie, an serves as the caipital o the Al Madinah Province. It is the seicont holiest ceety in Islam, an the burial place o the Islamic Prophet Muhammad an it is historically significant for being his hame efter the Hijrah. The significance o Medina stems frae the presence o the historically significant an auldest mosques in Islam, namely; Al-Masjid al-Nabawi (The Prophet's Mosque), Quba Mosque (the first mosque in Islam's history), an Masjid al-Qiblatain (the mosque whaur the qibla wis switched tae Mecca). The Islamic calendar is based on the emigration o Muhammad an his follaers tae the ceety o Medina, which marks the stairt o the Hijri year in 622 CE, cawed Hijra (هجرة). Similarly tae Mecca, entrance tae Medina is restrictit tae Muslims anerlie; non-Muslims are neither permittit tae enter nor travel through the ceety. Muslims believe that the latter verses o the Quran wur revealed in Medina an its surroondin ootskirts, cried the medinan suras. ↑ Sandra Mackey's accoont o her attempt tae enter Mecca in Mackey, Sandra (1987). The Saudis: Inside the Desert Kingdom. W. W. Norton & Company. pp. 63–64. ISBN 0393324176. ↑ Cuddihy, Kathy (2001). 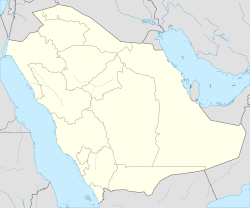 An A To Z Of Places And Things Saudi. Stacey International. p. 148. ISBN 1900988402. Wikimedia Commons haes media relatit tae Medina.